A growing number of homeowners are choosing to add the Mafran limestone fireplace with casting to grace their properties because of its sheer simplicity that also makes a subtle impression. Only the highest quality fine grain Portuguese limestone is selected for constructing the Mafran limestone fireplace with casting, one of the most versatile fireplace choices available because you have your choice of either decorative gas or decorative electric fire, with four interior options. 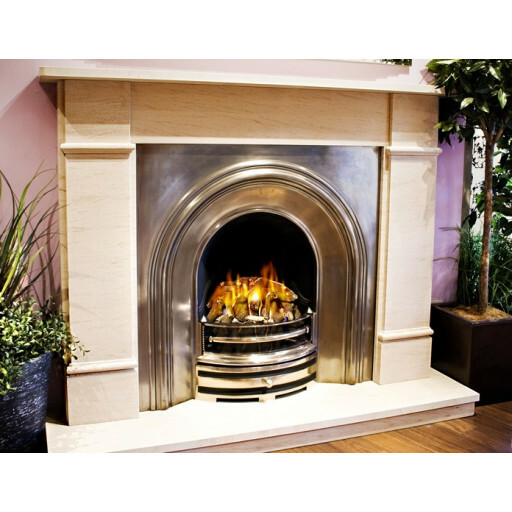 These include a shiny Crown casting that nicely reflects the glow of the fire, a flat back panel, a cosy brick chamber or a 5 piece limestone chamber. This is a solid and durable work of art that can be enjoyed by every generation in the family. When modified, the Mafran limestone fireplace with casting can also be used with solid fuel fires, although excess heat may cause tarnish to the interior chamber. The warm yet neutral colour of the Portuguese limestone used to construct the Mafran limestone fireplace makes for a happy marriage with already existing décor, blending in nicely while at the same time standing on its own as an impressive focal point for attention in the room.